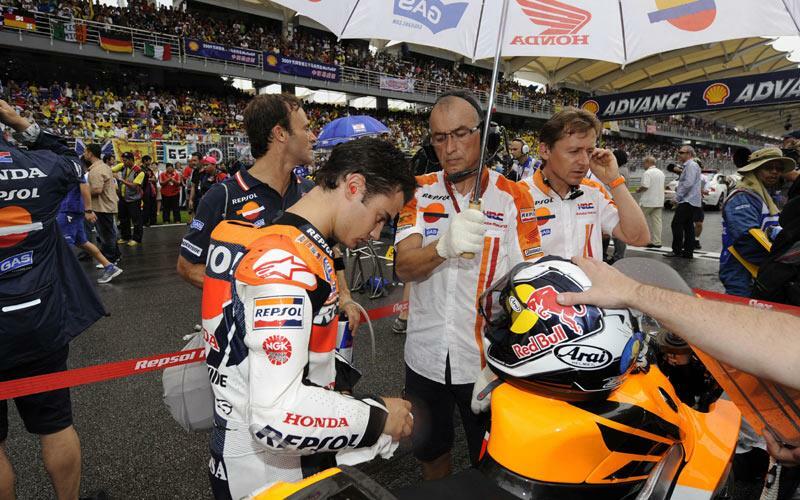 ﻿ Dani Pedrosa: “We must improve the stability"
The 2009 season was not an easy season for Dani Pedrosa. An accident-filled pre-season, with operations and recovery time included, prevented the Repsol Honda rider from arriving at the first race in Qatar with his homework done. Since then, they continued to drag behind, both in the technical aspects of the bike and the physical form of the rider. In spite of all the trouble this season has caused the Repsol rider, Pedrosa has once again added two new victories to his list of MotoGP achievements. Now that the 2010 pre-season testing in Valencia has ended, Dani Pedrosa evaluates his year. Now that you have finally recovered and are in top shape, would you prefer the World Championship to go on a little longer? The highlight of the season? “The win in Valencia a few days ago was a great moment, but the Laguna Seca win was also incredible, on that circuit and after everything that had happened since pre-season testing. “The worst moment was possibly in winter, during pre-season testing. I had a really tough time; I couldn't recover properly from the injury to my left knee and had to have another operation…, it was a really long period. And crossing the finish line last Sunday, what were you thinking? “It was an incredible sensation because we had all been thinking, dreaming and hoping for this win all week and finally winning in front of all the fans was amazing. “I've learned that you have to be there, you have to fight and go on fighting, and that above all, you can never give up, because then you're not going to get anywhere. How have you adapted to the options proposed by Bridgestone, and what do you think of the switch to the single tyre? “Well, the adaptation process wasn't easy for us because the Honda RC212V is a bike that was developed on the Michelins and their specific performance, so we had to work throughout the season to try to make the bike competitive on the Bridgestones. "And that wasn't easy, considering that you don't have time to test in a Grand Prix weekend and that I had such an accident-filled pre-season with hardly any time to test. You rode a 990cc for a year. Do you miss the Repsol Honda RC211V? “2006 was my first year in MotoGP and the last for the 990cc. Those bikes were very different to those we ride now, that's true, and from my experience that year; they were a lot more fun. What do you ask of Honda next year? “The same as I have been asking lately: improve the stability of the bike when braking and entering curves because that's where our Achilles' heel is. After three testing days, do you think you are going in the right direction? What needs improving? “It's still too early to evaluate what we should or must improve. Valencia is an unusual and special circuit where whether the chassis goes well or badly can be camouflaged by the type of curves and angles it has. "But in the next test, in Malaysia, we will quickly pinpoint whether we have a competitive base or not and if we have improved the stability of the bike when braking and entering curves with the new chassis. How would you evaluate your first contact with Öhlins? “In general, positive; the first two testing days in Valencia -the Monday and Tuesday, after the Grand Prix- were complicated because we couldn't get the right initial set up to ride fast. What did you say to Hiroshi Aoyama and Julito Simón, after both were crowned World Champions in 2009? “I congratulated both of them. To be honest, I was made up; I was very happy for both of them. "I think that they deserved it; they worked very hard for it and finally they did it. I'm made up that they did it; it hasn't been easy for either of them because they have been trying for many years, and not just anybody can win a World Championship. With less testing and the World Championship not getting back into action until 11 April, how will you spend so much time without racing? “Taking a break, resting and disconnecting a little are always good; it helps you to physically and mentally recover to tackle the new season as good as new. "So the fact that we all have the same break at the end of one year and the beginning of the next is good. “Above all, rest a little and spend time with my family and friends. And disconnect, because it has been a very long and tough year for me.